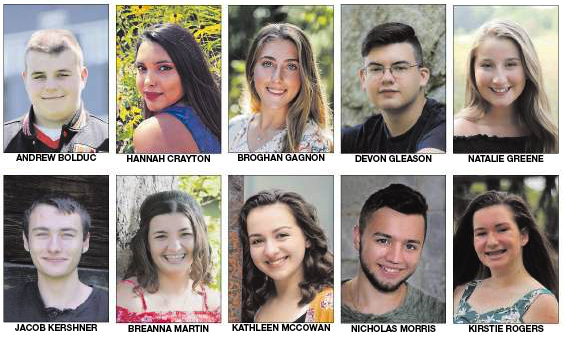 Winslow High School recently announced the following students, listed alphabetically, as its top 10 seniors of 2018. Andrew Bolduc is the son of Jill and Peter Bolduc, of Oakland. He is a member of the National Honor Society and was a delegate to Dirigo Boys State. He played football and plays baseball and was on the All-Academic Team for football. Bolduc plans to attend the University of Maine to major in chemical engineering. Hannah Crayton is the daughter of Andrea and David Crayton, of Winslow. She is a member of National Honor Society and received the Wellesley Book Award in 2017. Crayton dances at Laurie’s School of Dance and is involved in the school’s drama program and enjoys family time. Crayton plans to attend Thomas College to major in elementary education. Broghan Gagnon is the daughter of Tammy and Michael Gagnon, of Winslow. She is a member of National Honor Society and the W Club. She received the Stephen V. Belanger Memorial Award as a junior. She also volunteers at the soup kitchen. Gagnon played varsity basketball and was senior captain. She played varsity soccer and softball and was a her captain junior and senior years. She plans to play softball at the University of Maine at Farmington, where she plans to major in elementary education. Devon Gleason is the son of son of Celeste and Trevor Gleason, of Winslow. He is involved in drama and is a member of the International Thespian Society. He received the Phi Beta Kappa Academic Achievement of Maine Award. Gleason plans to attend the University of Maine and plans to major in biochemistry. Natalie Greene is the daughter of Danielle Greene and John Greene, of Winslow. She is senior class president, a member of National Honor Society, and volunteers at the soup kitchen. She is the school’s Maine Principal’s Award Recipient for 2018. Greene played field hockey, softball and unified basketball, and plans to continue her field hockey career at Wheaton College in Massachusetts, where she intends to major in psychology. Jacob Kershner is the son of Justin Kershner, of Winslow, and Peggy Sherwood. He is a member of National Honor Society and the National Technical Honors Society. He won the gold in the local Skills competition and the bronze in state competition for machining. He also was the Mid Maine Technical Center’s Student of the Month and Student of the Year. He volunteers at the soup kitchen, mentors three students, and participates in Red Cross blood drives. He also works at McDonald’s and at Pine View Homes. Kershner plans to attend the University of Maine to major in mechanical engineering technology. Breanna Martin is the daughter of Diana and Steven Martin, of Winslow. She is a member of the National Honor Society, and the 2017 DAR Jenny Paine Howard History Award recipient and the George Eastman Young Leaders Award winner. Martin was a varsity member of the Winslow/Waterville swim team and the varsity soccer team. She also painted a mural in the WHS Guidance Office. Martin plans to attend the University of Maine to major in kinesiology. Kathleen McCowan is the daughter of Jennifer and Thomas McCowan, of Winslow. She is a member of National Honor Society and the International Thespian Society. She also is senior class historian and Student Senate president. McCowan plans to attend Muhlenberg College in Pennsylvania to major in dance. Nicholas Morris is the son of Erica and Vicente Morris, of Winslow. He is a member of the drama club and the International Thespian Society. He also is a member of the National Honor Society. He volunteers at Camp POSTCARD and works at Central Maine Orthotics and Prosthetics. Morris plans to attend the University of Maine to major in chemistry. Kirstie Rogers is the daughter of Aimee and Kenneth Rogers, of Winslow. She is a member of National Honor Society and the math team. Rogers was captain of the swim and cross country teams and also track and field. She was KVAC All-Academic in swimming, cross country and track and field. Rogers plans to attend the University of Maine to major in chemical engineering.